Discussion in 'Designers and Collections' started by sedirea, Sep 19, 2009. I love the leggings in the second post! a HUGE improvement from some of their collections lately. Vie (or whatever it was last time) was hideous. Love the leggings. I sense a really involved DIY coming on. I love their aesthetic but I wish they would do something other than black, white and gold season after season. this is one of my favorites so far since i havent been too blown away by many things this season. however, i do think i agree with you, merveille, on the color story... or lack there of... there isn't really anything going on with the colors. but the metallic part of it is cool, i guess. it is very fresh, and i love the colour story actually....but i just can't say im in love with this collection. im still on the fence, i guess. soooooooo gorgeous and quite exquisite....they are severely missed at new york fashion week. 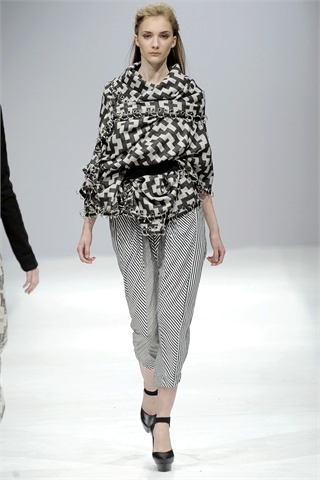 and i must say that i think it's quite bold for a brand like sass and bide to put a suit on the runway. adore and in love with this! Some really nice pieces. Especially the suit. Very elegant. But it puts me in mind of Lagerfeld and Lagerfeld for Chanel. I like it. It's interesting AND wearable. However it's not exciting enough for me to ever go "omg i neeeeddd this in my life. I would like it to suddenly appear in my closet, though.